The No. 2 Porsche 919 Hybrid has claimed overall victory in the 85th running of the 24 Hours of Le Mans, following a come-from-behind run in an attrition-filled and bizarre race that saw every single LMP1 car hit mechanical trouble. Timo Bernhard passed the LMP2 class No. 38 Jackie Chan DC Racing Oreca 07 Gibson of Ho-Pin Tung for the outright lead with only 1 hour and 7 minutes to go, after charging back from a nearly 20-lap deficit due to a front motor generator unit failure in the third hour. While being the first of the LMP1 hybrids to run into issues, and spending more than one hour in the garage for a full rebuild of the front axle, Bernhard and co-drivers Earl Bamber and Brendon Hartley worked their way through the field while others fell by the wayside. Pre-race favorites Toyota Gazoo Racing saw two of its three TS050 Hybrids retire prior to halfway, with the No. 8 entry having a lengthy stop, also to replace its front MGU, with the sister, then-leading No. 1 Porsche having a trouble-free run until less than four hours to go when Andre Lotterer ground to a halt on-track after reporting low oil pressure. The No. 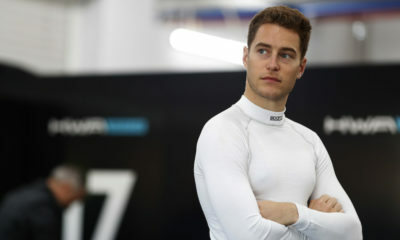 1 Porsche’s retirement put a LMP2 car into the overall lead for the first time in the race’s history, in the hands of 19-year-old Silver-graded Le Mans rookie Thomas Laurent, who led for nearly two hours. Bernhard’s ten to 15-second per lap advantage over the Jota Sport-run Oreca 07 Gibson, however, saw DC Racing’s two-lap lead steadily evaporate, compounded by a rear-deck change for the LMP2 contender, which cost the Chinese squad nearly one minute in the pits. The 2014 FIA World Endurance Champion crossed the line 1 lap ahead of the LMP2 class-winning DC entry of Ho-Pin Tung, who held onto second overall, despite late-race overheating concerns. LMP2 cars claimed eight of the top-10 finishing positions, with the No. 8 Toyota of Anthony Davidson, Sebastien Buemi and Kazuki Nakajima coming home 9 laps behind in 9th overall after its lengthy delay in the eighth hour. Only two of the six LMP1 cars finished, in the worst reliability record since the category’s launch with hybrid drivetrains in 2014. The pole-sitting No. 7 Toyota led from the start and held nearly a one-minute lead until clutch issues in the 10th hour, which saw Kamui Kobayashi slow on track and ultimately abandon the car at the Porsche Curves. Less than 20 minutes later, contact from a LMP2 car resulted in a left-rear tire puncture and subsequent fire for the No. 9 car of Nicolas Lapierre. Like Kobayashi, Lapierre attempted to limp his Toyota back to the pits but parked the car within sight of pit entry, ending the Japanese manufacturer’s hopes of victory after coming less than ten minutes away from a sure-fire win last year. The No. 4 ByKolles Racing ENSO CLM P1/01 NISMO, the only LMP1 Privateer entrant in this year’s race, sustained a puncture at the start only to retire with engine failure after completing two laps. Despite the unusual rate of attrition, Porsche claimed its third consecutive win and record-extending 19th overall in the race. While it marked Bernhard’s second overall crown following his 2010 win with Audi and Bamber’s second in three years, 27-year-old Hartley scored his first win in the French endurance classic.